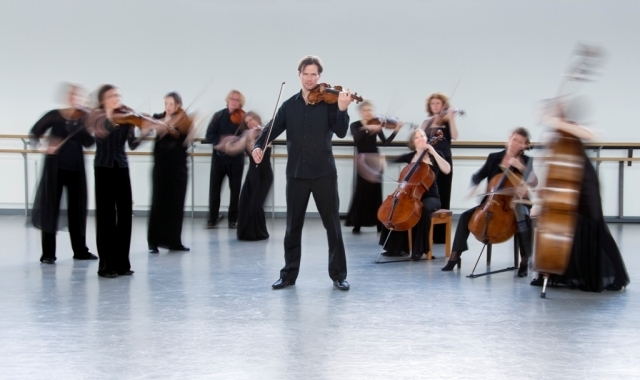 The Scottish Ensemble is a group of totally dedicated string players playing in Scotland; but not only Scotland, in England the Wigmore Hall and around the world. They are directed by Jonathan Morton; not only directed by but actively leading from the front and sometimes from the back view. 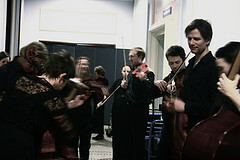 They feature old less well known music, often arranged specifically for the strings by Morton. And they also play new music commissioned by themselves. This weekend’s concert at the Queen’s Hall Edinburgh was no exception. Starting with Haydn – Symphony no 44 in E minor ‘Trauer’ (mourning) not the sweet Haydn but with a real bite. This was followed by a new piece specially commissioned, Wonderful Two – Headed Nightingale, by Luke Bedford, composer in residence Wigmore Hall. The piece is featured for violin and viola; Jonathan Morton, violin, and Lawrence Power, viola; they start alone and finish alone and the Ensemble in the middle – the strings augmented by French horn and oboe: an altogether excellent piece. This was followed by a lost pastoral piece by William Alwyn with memories of Vaughan Williams and Delius. The concert was triumphally finished with Mozart’s Sinfonia Concertante in E Flat again featuring the violin and viola of Morton and Power in unison and in opposition in turn reflecting back on the Bedford piece. The Strings all stand as they play (excepting cello and double bass) and while the audience sit for the performance they almost stood for their applause for this performance. An Ensemble playing way above its weight.